We are looking for partners and co-conspirators to help develop new work for processional performance. 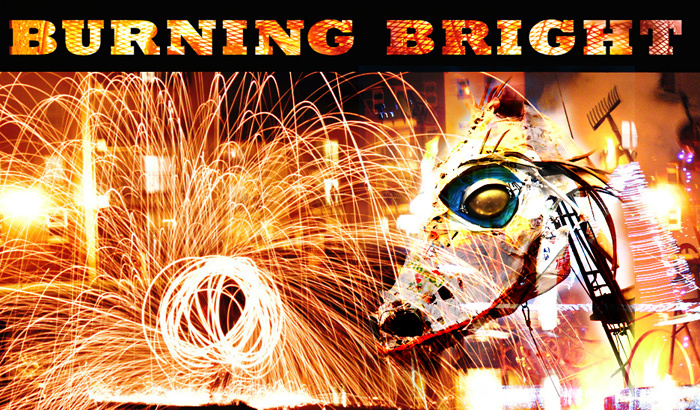 Burning Bright: an Illuminated Bestiary; is one such idea. We want to engage directly, viscerally and generously with audiences, and have ideas we would like to research & explore around: high intensity animation and performance of beasts, puppets and devices; mobile sound sources and generation; LED, electro-luminescent and other low voltage lighting; integrating fire, pyrotechnics and special effects into parades and much more.